Do you have missing teeth, or teeth that are so damaged or have so much dental work that they need to be extracted? It may be that your missing teeth are causing you embarrassment. You may be reluctant to go places and see things. Is your life being hampered because you’re afraid to smile in public? Dr. Wayne Harper and his team want to help. We can offer a system that can help give you your smile and maybe even your life back. That system is dental implants, using implant dentistry. Implant dentistry is the process of inserting dental implants in the gaps in your smile. Dental implants in Ocala can be used for one missing tooth, several teeth, all of your teeth, or with implant supported dentures so you can have a full, healthy smile again. Dental implants offered at our practice near Ocala and The Villages are a small titanium rod inserted into your gums that fuses with your jawbone. This implant dentistry fusing takes 3-6 months. 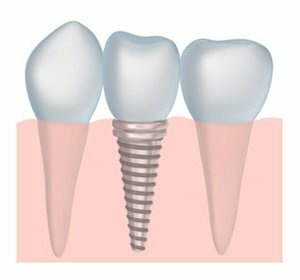 After the dental implant is healed, we restore that tooth implant by placing a custom made dental crown on the tooth implant. 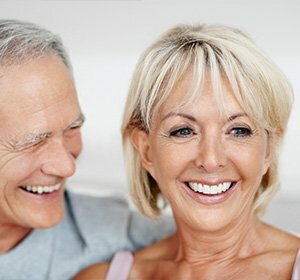 Why is implant dentistry such a great treatment? A tooth implant looks just like a natural tooth. Topped with a custom made dental crown, the crown is sized, shaped and color matched to look just like your natural tooth. Dental implants require no special care. Simply brush and floss as usual and see your dentist regularly. A tooth implant feels like a natural tooth and can give your mouth that full, complete feeling. If you have a space in your smile where several or even all of your teeth are missing, dental implants can secure implant supported dentures or a dental bridge. A tooth implant is sturdy, durable and can last your whole life. Dental implants are actually a “new” tooth root, and can keep your face from looking haggard or sunken in, which often happens when teeth along with their roots are missing. If you are interested in implant dentistry in Ocala, call today and amazing oral health! Dr. Harper offers these services to everyone in the Ocala and The Villages!